Liberty RV is the most trusted name in travel trailers in the region. With so many dealers to choose from, there is only one logical choice when looking at new and used models at affordable prices. We invite you to browse the impressive new and used inventory on Liberty RV’s website to see what they can do with your budget. Financing is available right on the site, so you can get pre-approved to purchase the RV of your dreams before you even start looking. You’ll find a great deal on a used RV at Liberty RV Sales in Lees Summit. Take a look at the barely used 2017 Forest River RV from Cherokee Arctic Wolf, priced right with an additional $5,000 discount off of the list price. You and your family will enjoy camping to the max in the bunkhouse fifth wheel with double slides for extra space, an outdoor kitchen, inside residential refrigerator and numerous amenities to make camping fun. You can see the floor plan for this model on the website and read more about its specifications just by clicking on the listing. This travel trailer sleeps 7 comfortably and offers a 49 gallon fresh water capacity! Thinking about buying a new RV? The Palomino Columbus fifth wheel is everything you’re dreaming of and more! Featuring 5 slides for the ultimate interior space, the Palomino Columbus can sleep 6 and offers too many amenities to list. This is an RV you’ll have to see with your own eyes to believe. Photos, floor plan, and specs are available from the ‘New RV’ link on the home page. Visit the website or make a call to a sales specialist at 816-489-5232. Do you have a trade in? Fill in the submission form online with a few details about the RV you currently own and someone will get back with you promptly with a trade in value for your RV. You’ll get the best trade-in price anywhere by dealing with Liberty RV Sales in Lees Summit. Financing is also available that can ensure you’re able to afford the RV you’ve got your eye on. Apply over the website for approval on 15 and 20 year terms that will meet your needs and fit your current budget. Call now and speak with an RV specialist about your next purchase. 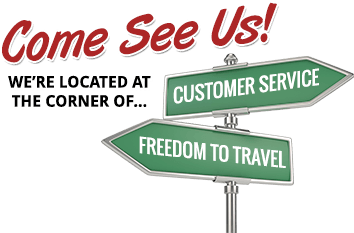 Liberty RV is always happy to help their customers find the ideal match for their camping needs. Feel free to use the convenient tools on the website to search instantly for your perfect RV. Simply click ‘new’ or ‘used’, select the type of RV you’re interested in, the floorpan desired, or the stock or model # and hit search. Narrow down the results with your preferred criteria for faster searching. Once you find something you like, stop by the lot to have a closer look. You’ll never regret doing business with a reputable RV sales dealer in Lees Summit.